I watched the movie Revolver the other day. 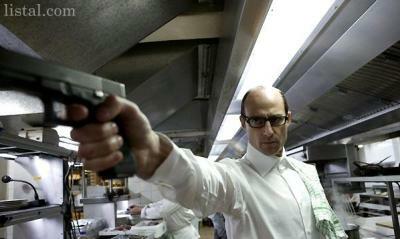 There was a guy in the film named Sorter, played by Mark Strong, who was known as the guy who never misses a shot. As a member of the mob, he was usually called upon for the big jobs that needed to be done right. There is a part in the movie where you get to see Sorter put his boss in line when a little girl is about to be harmed. It is when he snaps that we get to see his shooting skills. There was no doubt about it...this dude was a professional marksman. When a man takes his craft or trade seriously people step back and take notice. We can learn a few things from Sorter on how to be more of a Pro at work. In your job, precision still matters. If I get surgery, you better believe I want the surgeon to be on the mark. If my house was on fire, I would want the fireman to show at the right house. If I was sending my kid to a teacher who didn’t know the right answers, I would be pissed. The reality is precision matters and the closer you are to hitting the mark on the job the more you will be respected and used. ​The definition of methodical is “acting in a systematic way, especially careful and deliberate.” In the movie, Sorter deliberately takes out the opposition, one right after another. He does it in such a calm, efficient and methodical way that no one can doubt his skill. Be methodical in your job. Know your job so well that you can calmly do what comes next. As a result, you will be faster and better than the others, because you know what follows. That will make you a valued asset to your company. ﻿Sorter used a Glock. What are the tools of your trade? Even if you don’t have tools in the traditional sense, you still have a skill set necessary for your trade. Sharpen, clean and prepare those tools so you can do your best work. A workman is only as good as the tools he has. ​Throughout the movie, Sorter remained completely calm and ready for oncoming situations. In a crisis at the office, calmness is seen by your boss and coworkers as strength. People who are calm in a crisis produce well reasoned solutions. Notice I said calm, not apathetic. Apathy is viewed as poor leadership and unprofessional. ​Once he made a decision, doubt was out the window and he went for it.